Favorite ِArabic, Middle Eastern, and International Recipes. 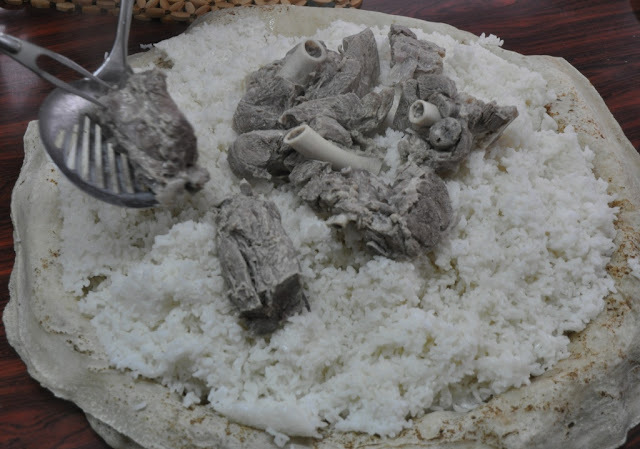 Mansaf is the national dish of Jordan. If you have ever been to Jordan and not eaten a Jordanian Mansaf, for me, this equates as not visiting Petra! Mansaf is served as the main dish in most social occasions from weddings to graduations to special events. 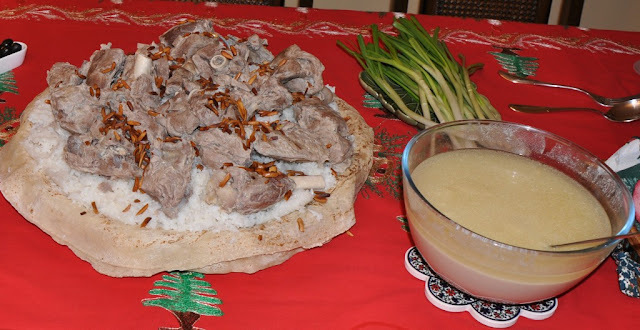 Among Jordanians, especially Bediouns, serving Mansaf is a gesture of hospitality and honor. Traditionally, Mansaf is served on a very large dish and eaten collectively, whereas guests stand around the platter, their left hand behind their back, and eat the Mansaf with their right hand. I find Mansaf just as good eaten with a fork or spoon. For years, I was shy from cooking Mansaf thinking it is very complicated to cook and that you have to be an expert chef before you can contemplate cooking Mansaf! How wrong I was!!! Now, whenever I have a large crowd over, Mansaf is my safe haven. 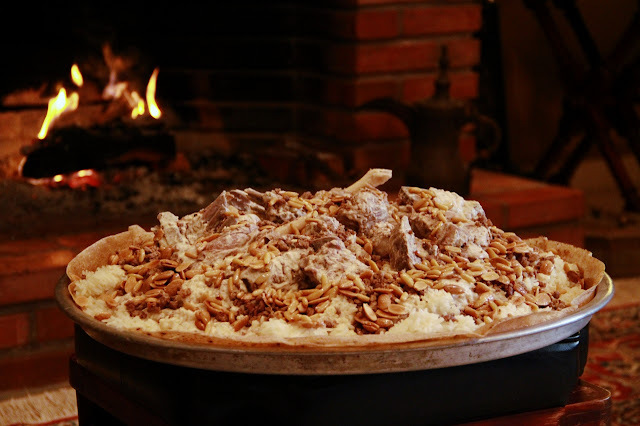 For starters, Mansaf is a main attraction, so when you are cooking it you don't need to complement with other dishes. To top that, all your work with Mansaf ends around 3 hours before serving, which gives you ample time to relax and get ready before your guests arrive!!! Exactly what I think we all need when we are expecting guests!! 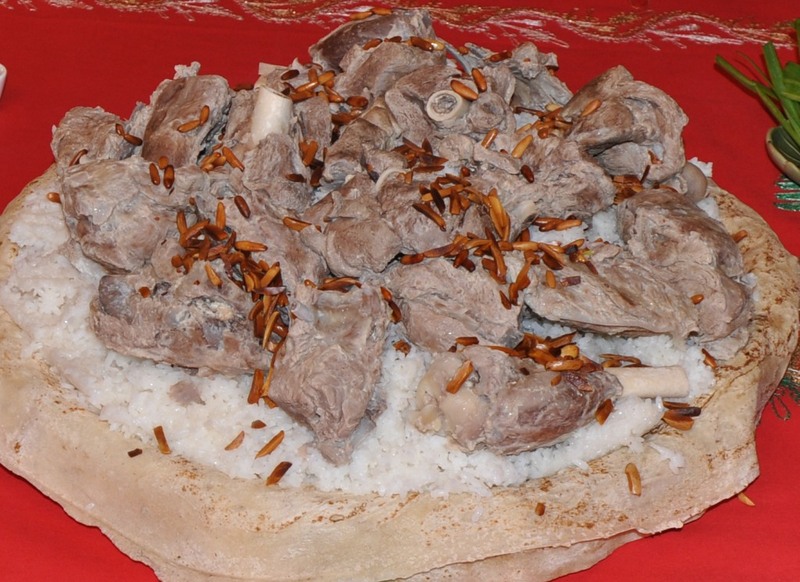 The main ingredients of Mansaf are lamb meat chunks and Jameed. 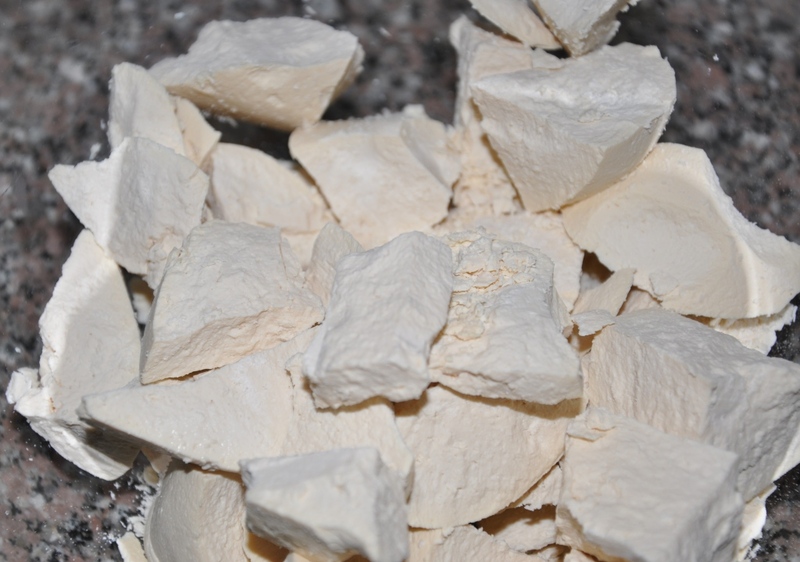 Jameed is hardened and dried salted yoghurt that is made from goat milk. The dense yogurt is formed into balls and them completely dried. The dried Jameed balls, often referred to as stones, keep well for months. In Europe and the U.S. you can buy Jameed from Middle Eastern or Arab specialty stores. The recipe portion here is for one about 350 grams Jameed stone, and is enough to feed about 8 people. Wash the meat very well under running water making sure that small bone pieces get washed. Place the meat in a large colander dish and sprinkle about 2 tablespoons salt on it. Place the colander on top of a large plate and put in the fridge overnight. The salt will drain the blood from the meat - that's why you need the large plate under, plus the salt acts as a tenderizer. Break the Jameed stone down into smaller chunks and place in a large glass dish, add boiling water to cover. Let stand overnight, covered. This process will soften the Jameed. Fry or toast the pine nuts and place over a tissue covered plate. Be careful when you fry as pine nuts tend to burn quickly, so the second they start turning light orange remove from heat. Fry or toast the diced almonds and place over a tissue covered plate. Boil some water. Scoop from the Jameed mixture and put in a blender, add some boiling water and blend until it is creamy consistency. Place a sieve over the pot you will use for cooking the Mansaf. Run the processed Jameed through the sieve. Return any chunks to the processor. Keep repeating this process until all the Jameed runs through the sieve. 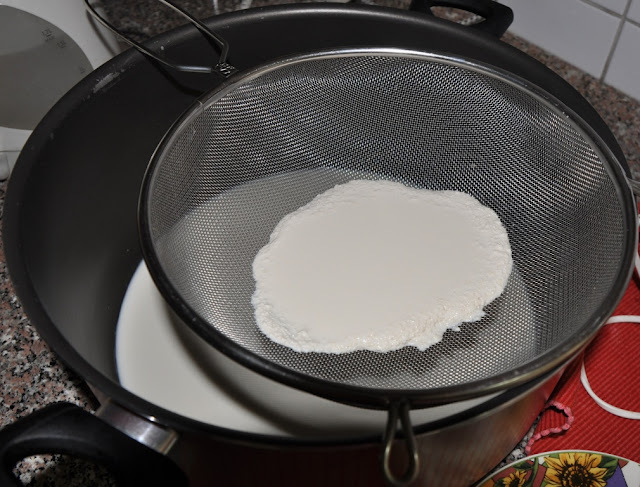 You can pour some boiling water over the sieve every once in a while. It sounds complicated but once you do it you will find it is quite simple. The Jameed consistency needs to be denser than milk but lighter than cooking cream. Set the processed Jameed in the cooking pan aside. Wash the meat well from the salt, place in a large cooking pot. Add water to cover the meat, one whole onion, the bay leaves and the black peppercorns. Boil for about ten minutes. Remove the pot from the fire and wash the meat well and add to the Jameed. When I first started to cook Mansaf I didn't use to do this step, I washed the meat and added it straight to the Jameed to cook. However, I found that doing this step removes all traces of blood. Add the meat to the Jameed. Add the whole onion, cardamon pods and 1/3 teaspoon turmeric. The turmeric is added for the yellowish color so you want to add a minimal amount that will give the color but no taste. Original Mansaf is yellowish color because ghee is used in the cooking process. Turn the heat on, once the Jameed starts to boil reduce the fire and let it cook over low heat for 3-4 hours. Heat the oil, add the rice and mix for 1 minute before adding the water, salt and pepper. Cover and cook over low heat. Cover a round stainless steel tray with 2 sheet of thin, flat Arabic bread (shrak). If unavailable in your region, you can do without. The size of the round tray depends on the amount of the food you made. Sprinkle about 1/2 cup cooked Jameed over the bread. Pour the rice over the tray. With a wooden fork break the rice and form it into a dome. Strain the meat and place it over the rice until it covers the whole top. Sprinkle the fried pine nuts and almonds on top. Place a sieve over a glass or stainless steel dish. Pour the cooked Jameed over the sieve to remove small pieces of bone, the whole onion and the cardamon pods. On your serving table, the dish with the cooked Jameed should be placed right next to the big dish with the rice and meat. The traditional way to eat Mansaf, Jameed is poured over the rice and meat and small balls of rice and meat are formed and eaten. The whole process is done with your fingers and hand. If you are using your own plate, place the rice and meat and cover with Jameed. Hope you enjoyed today's easy recipe: Jordanian Mansaf. Bon appetite. Have recipes delivered to your inbox! Clear instructions and good pictures. Don't the Badu use ghee in cooking the rice? Every time we had it in Shoubak the rice was yellow. Actually what turns rice yellow is turmeric which is among a spice mix (حواجة) usually added by some people to flavor ghee. I can't wait to try the Mansaf! Looks like fun to make. being Indian we normally prefer a lot of spice, but I've tried Mansaf at a gathering and I loved it... nice explanation!!! Want recipes sent to your inbox? 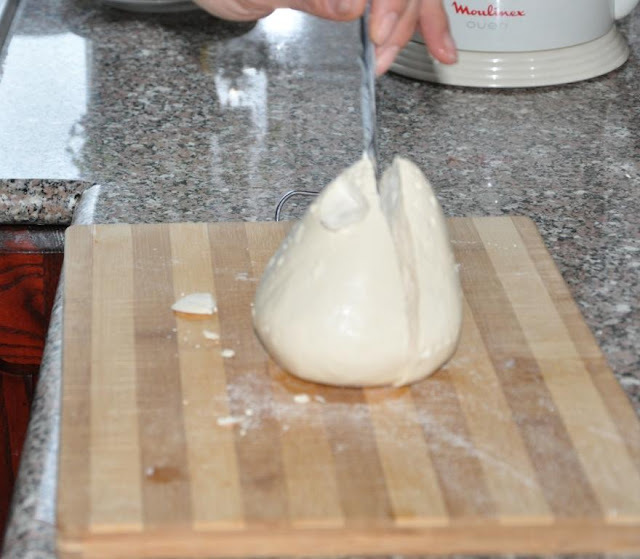 Please respect my work and reference source with link to dish-away.com when sharing my recipes. Powered by Blogger.